A quiet, spacious getaway in a fantastic location! This 2000 sqft townhome has it all and is close to everything. Mountain biking and hiking trails are just a couple 100 yards away - the Cady Hill trail network is right up the road. After a day of adventures, come and relax in this 3 bdr duplex townhome and enjoy a cozy place with beautiful views including the Worcester Mountain Range and the Stowe Pinnacle while sitting by the fire pit or enjoying a meal out on the deck. There are 2 spacious living room areas with large TVs and cable as well as a bar area to mix up your best cocktail concoctions. The kitchen is well stocked with all the amenities you need to make meals here or try out the amazing restaurants that Stowe has to offer just minutes away. Bedroom 1 has a king-size bed and beautiful mountain views. Bedroom 2 has a queen bed, and Bedroom 3 is located in the finished basement. This bedroom has a bunkbed and a twin bed - all suitable for adults or children. The owners live in the other townhome and are available to help you plan your stay. This home is a free-standing duplex on 2.5 acres. It is private, but close to everything! We look forward to hosting you! We are an active family of four. We settled in Vermont because we fell in love with the Green Mountains and everything that they have to offer. In our free time, we enjoy mountain biking, running, hiking, nordic and alpine skiing and golfing. We fell in love with this property as soon as we walked on to it because it is the best of both worlds. We are tucked away in the hills but close to everything. With a 15 minute drive to the ski mountain, a 10 minute drive to Trapp Family Lodge or a 2 minute drive to shopping and restaurants, we literally have it all at our fingertips. 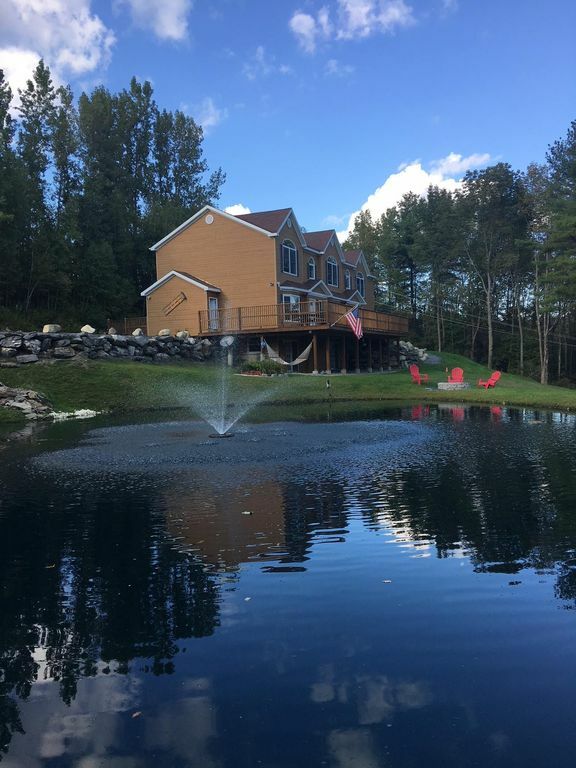 Our 2.5 acre property has an adorable pond and plenty of space to relax or play. And, right up the road are some of the best mountain biking trails in the area. The two homes in this duplex are spacious, full of natural light and tastefully decorated. With 2 living room areas, you can watch a football game or sneak away and cuddle up with a good book. The full bath is located on the 2nd floor right down the hall from the 2 bedrooms. The half bath is located on the 1st floor off of the kitchen. Restaurants, Shopping and entertainment are just minutes away. Stowe Mountain Resort is just 6.9 miles away! From this home, there are beautiful views of the Worcester Range that includes The Stowe Pinnacle and Mt Hunger. Great place to Stay near Stowe Mountain! Five of us stayed in Condo 1 for 2 nights for a ski trip. The house was really spacious, clean, nice and comfortable. It was everything we needed and wanted. I would highly recommend this property! We recently completed a 5-night stay at this lovely home, and it suited our needs perfectly. It's only 15-20 minutes from the base of Stowe, and even closer to many of the great restaurants and shops. The house had everything we needed, and, importantly, the beds were all quite comfortable. Our host was readily available if needed, and I would highly recommend this for families traveling to the Stowe area. My wife and I stayed at the Cady Hill Retreat this last weekend for our anniversary. The rental is very clean, comfortable and convenient to the downtown Stowe activities. The owners were very helpful and even started an outdoor fire on the nights that we requested. We highly recommend this property to all and look forward to staying there again in the future. Great condo. Good location and nice fire pit out back. Great condo. Good location and nice fire pit out back. Hosts were very easy to speak with and get in touch. Stowe is the quintessential Vermont mountain town. At any time of the year, there is no shortage of things to do and see. Skiing, hiking, biking, golfing, festivals, local craft breweries, shopping, and restaurants area all just minutes away. When the weather is less than ideal, there is a family-owned cinema complex, bowling alley, The Swimming Hole (with an indoor pool and water slide) and plenty of beer, cider and spirit-tasting rooms. Ask us about our favorite places and we can help you plan your stay!